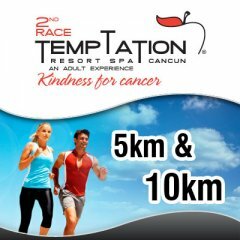 Get away from the ordinary and let loose at Temptation Resort Spa Cancun with the second Temptation 5 km & 10 Km races. This August 12th, you will have the chance to join our staff and run along Kukulcan Avenue as you get ready for our finish line celebration. This is the perfect opportunity to mix party and fun with working on your health... the moment we have been waiting for! You can't pass on these exciting days and nights our adults only resort have prepared for you. Whether you love running or you simply like to watch, it's time to run wild at Temptation, win excellent prizes and have a blast.